I grew up in New Jersey, but for most of my adult life, Pennsylvania has been my home. This week I’m delighted to attend the Pennsylvania Library Association Annual Conference in Gettysburg (which also happens to be the location of my alma mater, Gettysburg College. Most people who live outside the state know Pennsylvania for its two most populous cities: Pittsburgh and Philadelphia, for its communities of rural Amish, and also for its large deposits of coal and natural gas. But the Commonwealth also produces many fine authors, poets, artists, dancers, and musicians who are known worldwide for their creative work. 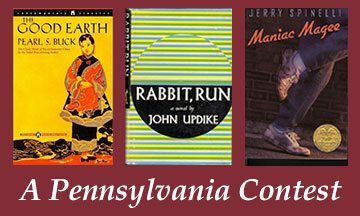 To help celebrate PALA, here are ten writers and ten cities in Pennsylvania. Match the writer with his/her city of origin and if you are the first one to email me the correct answers, you’ll win a signed copy of any Jen Bryant book you choose on my author website. Good luck! Congratulations to Sally Herzog, who now lives in NY, but grew up in southeastern PA. Sally was the first person to correctly match each writer with his/ her Pennsylvania city of origin. Sally chose a signed copy of Ringside 1925: Views from the Scopes Trial as her prize. Thanks for playing, Sally—and enjoy the novel!